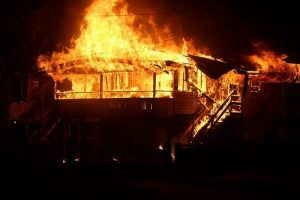 Fire early Friday morning destroyed a house at Tucber, New Amsterdam, leaving a fireman homeless. Fire Chief, Marlon Gentle told Demerara Waves Online News that based on preliminary information, the fire originated from a kerosene lamp. Sources said the house had no electricity. Gentle said fire fighters confined the blaze to one house located at the back a few houses away from the ball field.